This is an Forex Strategy based on the trend momentum indicators. Look at the trade example below: You can see that both of MACD indicator,Awesome indicator are in negative values, however they are increasing, and Dss Bressert indicator Cross upward; Simplicity makes this system beautiful;) However you’ll find that this forex strategyworks very well. Fixed profit Target depends by time frame and currency pairs. EUR/USD daily Time Frame 80 profit target. 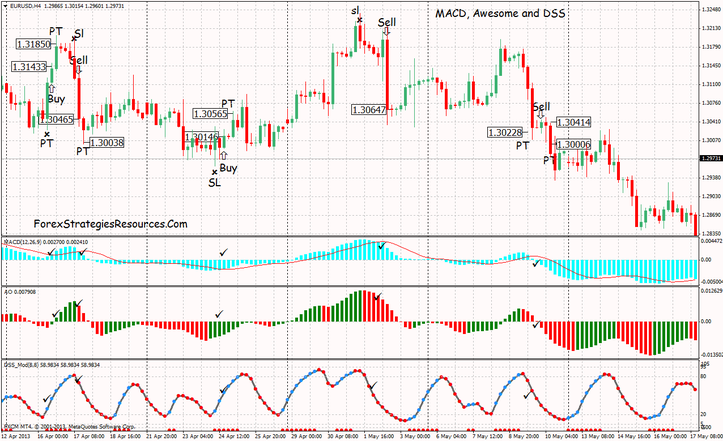 In the picture MACD, Awesome and DSS forex system in action.